An alfalfa based pelleted nutritional supplement formulated for horses to promote healthy dermal tissues including hoof growth. 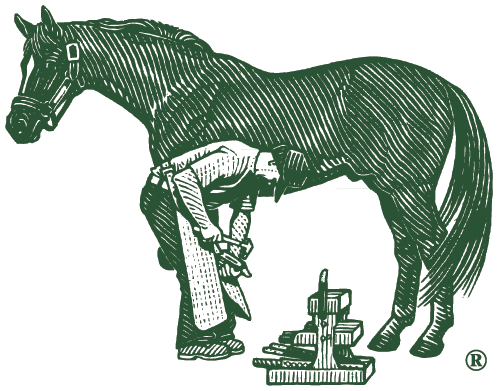 The nutrients in Farrier's Formula® Double Concentrate provide the building blocks for healthy hooves and hair coat. A low starch concentrated nutrient source designed to balance hay and pasture diets, prevent over supplementation, and eliminate the feeding of compounded feeds. An Equine Calming Supplement for horses prone to anxiety or excitability in stressful situations. A concentrated nutrient source formulated to promote healthy skin and reduce anxious behavior in dogs. Barn Bag® Adult Maintenance is a low calorie and low starch equine supplement that provides the horse with a daily fixed amount of important vitamins, minerals, amino acids, and fatty acids. These nutrients are often lacking in the equine forage diet. Barn Bag® is a concentrated nutrient source that increases the utilization of the hay and pasture diet. Breeder’s Formula® is a concentrated nutritional supplement formulated by veterinary nutritionists to promote healthy skin and reduce nervous behavior in dogs.